Breakfast can be taken in the Dining Room or on the front terrace. 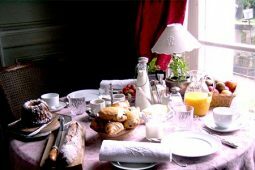 Guests can enjoy cereals, home-made yogurt, fresh fruit (much from the garden and orchard), home-made jams, local ham and farm cheeses, and a wide variety of breads and pastries, accompanied by freshly squeezed fruit juice, coffee, tea or hot chocolate. Meal-times in France are an important part of the day, when family and friends get together to talk over excellent food and good wine. 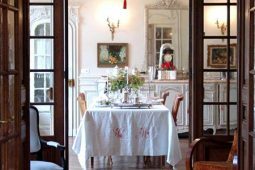 Enjoy a dinner at the Château to converse and to savor some of the many local and regional specialties. The cuisine is homemade with natural products. Although there is one menu, we adapt to our guests taste and allergies. When you reserve your dinner (€50 per person), you will be asked what you dislike eating so that a menu decouverte can be composed according to your taste. Local meat and dairy products are known in the region for their exceptional quality. 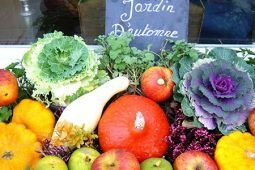 To enhance the local flavors we often use our own organic vegetables and fruit. If you plan to spend the day walking or cycling in the extensive communal forest or along country lanes or if you just prefer to laze in the park, we can also provide you with a picnic. The picnic hamper typically consists of fresh bread, home made paté or local ham, cheeses, salad and fruit, accompanied by wine, mineral water and a thermos of coffee. Just let us know the evening before. The quality of local pastures is evident from the masses of wild flowers that can be seen from spring-time onward and this same quality is to be found in local meat and dairy products. Bison and highland cattle are raised in the pastures adjacent to the Château and the region offers an extra-ordinary range of cheeses. 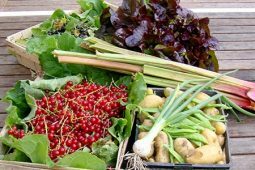 Organic gardening means we don’t use synthetic fertilizers or pesticides, but that doesn’t mean our vegetables are left to fend for themselves. In order to get the most out of our organic garden, we ensure that the soil is properly conditioned. Good healthy soil helps grow delicious vegetables. Our organic garden is located in the park of the Château. 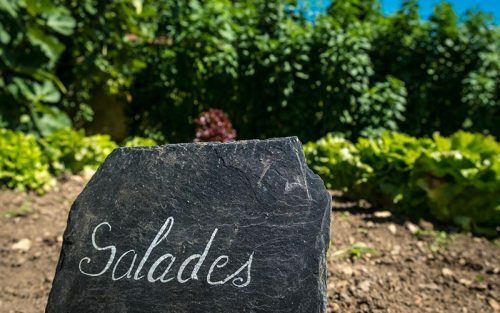 Step into our chemical-free world and experience the benefits of gardening in harmony with nature, a taste you will experience during one of our 5 course dinners. 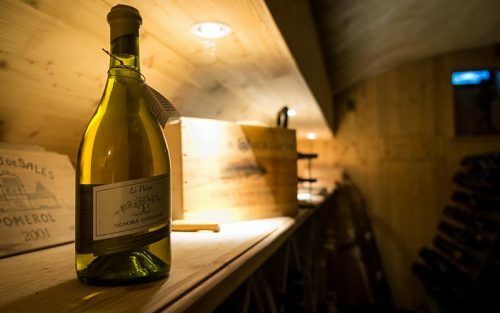 Directly underneath the Château we have a 30m2 wine cellar that houses wines from the region and selected wines from across the country. For us, good food is made even better by good wine and we are proud of the range of wines that we can offer our guests. Our wine selection includes La Demoiselle de By 2012 (2ème vin Château Rollan de By), Château Vernous 2012 (médaille d’or Féminalise, Beaune 2016), Château de Carolles 2013 (médaille d’or Paris 2015, guide Hachette 2016), Chardonnay Vieilles Vignes Maison Guillaume, and more. From our organic garden to your plate. The Michelin Guide agrees. Take your vacation today.